② Believe in and understand the power of employee advocacy and the social media networks – today people trust more opinion leaders, than brands. Allow and help your employees become positive and effective brand advocates. ④ Organize a free flow of information to mobilize every department. Knowledge informs proactive engagement and innovation. ⑤ → Empower employees – every employee must be enabled to own any customer interaction. ⑥ View customers as people, now transactions. 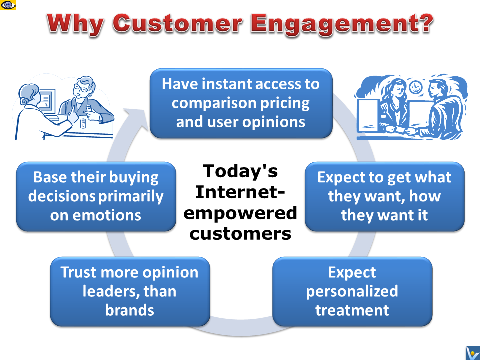 Keep in mind that up to 70% of customer decisions are based on emotion. ⑦ Optimize business designs for a frictionless and seamless customer experience. ⑧ Define an effective social media policy and ensure that employee posts are kept within this policy and best practices bounds. ⑨ Adopt flexible business processes and technologies to meet the changing needs of customers. Establish cloud-powered business processes – they are a rapid response to changing customer habits and expectations.